System for selection and control of the various front and rear lamps providing the vehicle's lighting. - directional headlamps for improved visibility when cornering. - daytime running lamps to be seen during the day. The lighting is controlled directly by the driver by means of the ring A and the stalk B . A. Main lighting mode selection ring: turn it to position the symbol required facing the mark. Lighting off / daytime running lamps. Dipped headlamps or main beam headlamps. 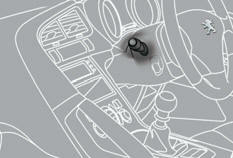 B. Stalk for switching headlamps: pull the stalk towards you to switch the lighting between dipped and main beam headlamps. In the lamps off and sidelamps modes, the driver can switch on the main beam headlamps temporarily ("headlamp fl ash") by maintaining a pull on the stalk. Illumination of the corresponding indicator lamp in the instrument panel confirms that the lighting selected is on. This operates with dipped and main beam headlamps. To switch off the foglamp, turn the ring C rearwards. When the lighting is switched on automatically (with AUTO model), the dipped beam headlamps and sidelamps remain on until the rear foglamp is switched off. The rear foglamp operates with the dipped and main beam headlamps. The front foglamps also operate with the sidelamps. 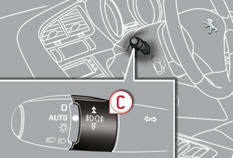 To switch on the rear foglamp, turn the ring C forwards. To switch on the front foglamps, turn the ring C forwards again. To switch off the rear foglamp, turn the ring C rearwards. To switch off the front foglamps, turn the ring C rearwards again. When the lighting is switched off automatically (with AUTO model) or when the dipped beam headlamps are switched off manually, the foglamps and the sidelamps will remain on. When the ignition is switched off, all of the lamps switch off automatically, unless guide-me-home lighting is activated. In some weather conditions (e.g. low temperature or humidity), the presence of misting on the internal surface of the glass of the headlamps and rear lamps is normal; it disappears after the lamps have been on for a few minutes. They come on when the engine is started. - sidelamps in day and night mode. 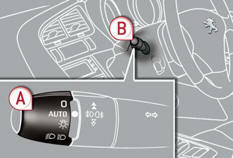 In countries in which this function is not imposed by regulations, with the vehicle stationary, use the navigator to activate or deactivate the function in the multifunction screen configuration menu. The sidelamps and number plate lamps come on as well. Programming The lighting duration is selected via the vehicle configuration menu. The duration of the welcome lighting is associated with and identical to that of the automatic For countries where the function is a guide-me-home lighting. legal requirement, it is activated by default. The temporary illumination of the dipped beam headlamps after the vehicle's ignition has been switched off makes the driver's exit easier when the light is poor. With the ignition off, "fl ash" the headlamps using the lighting stalk. A further "headlamp fl ash" switches the function off.